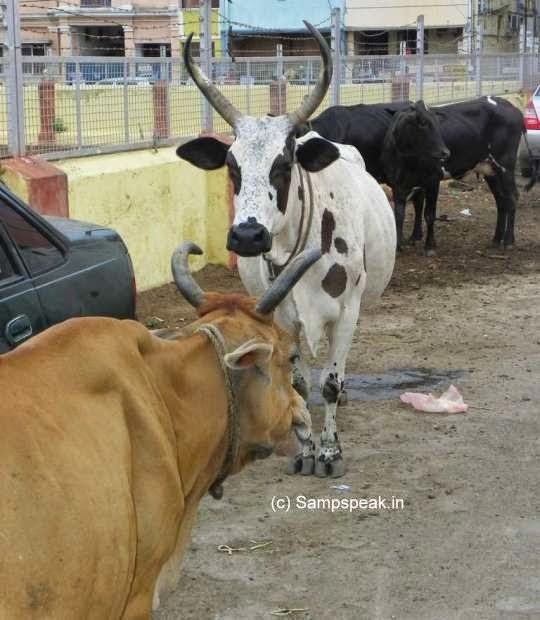 "Sampath Speaking" - the thoughts of an Insurer from Thiruvallikkeni: cruelty to cattle .... how gruesome to canulate cows !! cruelty to cattle .... how gruesome to canulate cows !! The picture down in the post made me sick …….. not that we are unused to seeing cows being treated badly… in this beautiful land, Cows are holy … Komata is sacred to us.. we worship cows … Thiruvallikkeni, the land of Lord Parthasarathi, the cowherd king, true to its tradition has many cows ….. but the cattle roam menacingly on the road, sometimes injuring people…..
once the cowherds flourished – now a days, not many buy milk direct from them – now they are a vanishing tribe .. there are still cows – they inject and milk them .. then let them roam on the street feeding on vegetables, trash and more … sometimes they thrash the cows with sticks … one would feel sad upon seeing cows running helter-skelter in fear – clear they do not get the right feed, do not get to have their usual life, artificially inseminated, male-calf killed or take away – as long as they give milk, some care – and then let loose when felt of no use…. For identifying the farm animals they brand them with hot iron, and in the name of Insurance, they pierce their ears with tags.. !! Still this post in Daily Mail titled ‘Hole-y cow!’ - How farmers are monitoring what cows eat using 'window' in their sides … made me feel sick. Away in Europe and advanced countries, farmers have a wealth of technology and data at their fingertips to get the best from livestock, but one old-fashioned technique still remains. 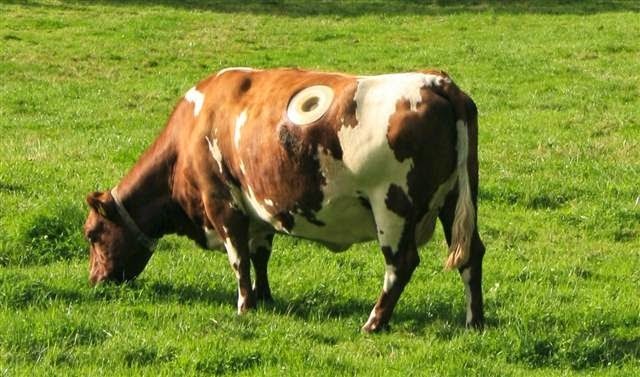 Researchers in Switzerland have fitted 14 cows with cannulas in their sides, that are cut directly into the animal’s digestive tract. The 8-inch (20cm) holes allow farmers to directly see how food is being processed, and are plugged using rubber stoppers when not being used. The cannula acts like a porthole and gives direct access to the cow’s rumen. Once the cannula is surgically placed in the cow, the animals grazes for a set period of time before being examined. Farmers remove the plug and pull the grass and oat mixture from the rumen. This material is collected and tested and this analysis shows farmers and researches which forages get the best results from the livestock, based on how much is digested. The practice is said to have become common place in the 1920s but reports of cows being used in this way for scientific research date back to 1833. Cows with cannulas fitted are also known as fistulated cows. Agroscope, in Grangeneuve, Switzerland uses the cannulated cows to test the digestion of different, experimental blends of oats to create a more balanced feed for the animals. A cannula (from Latin "little reed"; plural cannulae) or canula is a tube that can be inserted into the body, often for the delivery or removal of fluid or for the gathering of data. In simple terms, a cannula can surround the inner or outer surfaces of a trocar needle thus extending needle approach to a vein by half or more of the length of the introducer. A cannulated cow can be referred to a cow that has been surgically fitted with a cannula. 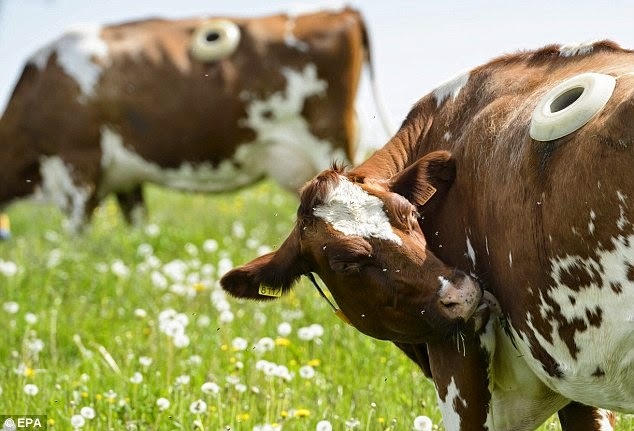 Researchers claim the process can help the environment by improving the energy efficiency of cows, which in turn reduces the amount of methane they produce. The cows are anaesthetised during the surgical procedure and are said to experience no pain when being examined. But animal rights campaigners claim it is abuse…. What else it is ?!?!? - certainly cruel and barbaric – imagine the pain and discomfort…. Will they dare to try it on fellow-humans / themselves ? ~ often, mankind inflicts unimaginable suffering on animals in the name of research and test … who will fight this tremendous injustice to animals.. It is not hol(e)y Cow … it is whole-heartedly cruel ruthless humans. canulated cow photos taken from web ... picture credit to its original owners.